I’ve probably said it before, and will say it again, and I’m also sure that I’m not the first, or the last to make this point, but I have yet to see an example of an open source design process that has worked. Indeed, I’d go so far as to wager that “open source design” is an oxymoron. Design is far too personal, and too subjective, to be given over to the whims and outrageous fancies of anyone with eyeballs in their head. Call me elitist in this one aspect, but with all due respect to code artistes, it’s quite clear whether a function computes or not; the same quantifiable measures simply do not exist for design and that critical lack of objective review means that design is a form of Art, and its execution should be treated as such. Apple source code pointing to social features? File this in the wild conjecture/handy-waving category. I did some random digging today and stumbled upon something that could be pretty interesting, or, could be nothing more than the equivalent of the human appendix of Leopard: remnants of a good idea that somehow along the way never got completed, but traces of it still exist in the modern state for no apparent reason than to confuse and confound those with too many mental faculties at his disposal. But let’s go with the what if? take. What with my interest in getting people into software in interesting ways, this one seems, like cave paintings, to point to earlier attempts at some fundamental type of expression of a very contemporary idea. Anyway, the thing is this. While poking around Articles.js in Leopard’s PubSub.framework (you’ll need to be running Leopard for the Articles.js link), I noted a call to a couple functions having to do with FOAF, in particular function loadFOAF( ) and function receivedFOAF( html ). I talked to Tantek about this and apparently it had to do with some misbegotten effort to bring FOAF support to Safari but that it was effectively stillborn for reasons I can’t recall, but what was interesting was that, tucked away, I discovered a seemingly orphaned file called Friends.html (again, Leopard only). I started poking around the PubSub.framework for other clues… (And so you know, the Leopard PubSub.framework is effectively a system-level toolkit for subscribing to RSS and ATOM feeds and maintaining read/unread status universally — something that Windows Vista also apparently has. In any case it’s pretty cool, and it’s also new with Leopard). 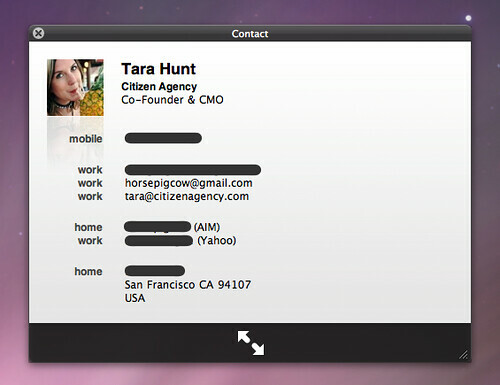 @abstract   Returns the Address Book record associated with the receiver. by looking up the email address or URL in the Address Book. Note the discussion: In the future, this method may attempt to locate a default ABPerson by looking up the email address or URL in the Address Book. This means that Apple intends (or at least as far as I can make out from reading the tea leaves) to use the Address Book as a store for feed authors… and that — who knows — you may end up using your Address Book to read feeds from so-called “ABPersons” or, moreover, their interest in FOAF might have been a means to automagically grab your list of friends (say, from LiveJournal) to populate your Address Book — then, using ATOM discovery and the PubSub.framework, could have pulled in feed updates from all your friends, giving you effectively a local social network that could power — who knows what kinds of applications! In any case, I could be totally off here, but there’s something in this… could it be somehow related to the Mail.app feedreader functionality? I’ll offer one more hint that seems to suggest that my Coverflow for People idea isn’t too far off… If you take a look deep in the QuickLook.framework directory you’ll find a couple of very curious images: Vcard16.png, Vcard32Base.png, Vcard32Border.png, Vcard128Base.png, Vcard128Border.png, Vcard512Base.png and Vcard512Border.png. There aren’t any other filetype-specific graphics in this directory, and yet QuickLook is useful for all kinds of files across the OS. Is it significant then, when I browse the Address Book Metadata that I get cards like this? Author Chris MessinaPosted on Nov 13th Categories Digital Identity, Raw Materials, Technology9 Comments on Apple source code pointing to social features? I wonder if Tim O’Reilly knows something that he’s not telling the rest of us. Or maybe he knows something that the rest of us know, but that we haven’t been able to articulate yet. Who knows. In any case, he’s been going on about this “Address Book 2.0” for awhile, and if you ask me, it has a lot to do with Google’s upcoming announcement of a set of protocols, formats and technologies they’ve dubbed OpenSocial. Let me center the context here. A few days ago, I wrote about putting people in the protocol. I was talking about another evolution that will come alongside the rush to be open (I should note that “open” is an ongoing process, not an endpoint in and of itself). This evolution will be painful for those who resist but will bring great advantage to those who embrace it. It’s pretty simple and if you ask me, it lies at the heart of Tim’s Address Book 2.0 and Google’s OpenSocial; in a word, it’s people. This completely misses the point. This is why the first bubble was so lame. So many people had third-world capital in their heads and missed what’s new: the development, accumulation and exchange of first-world social capital through human networks. Now, the big thing that’s changed (or is changing) is the emphasis on the individual and her role across the system. Look at MyBlogLog. Look at Automattic’s purchase of Gravatar. Look at the sharp rise in OpenID adoption over the past two years. The future is in non-siloed living man! The future is in portable, independent identities valid, like Visa, everywhere that you want to be. It’s not just about social network fatigue and getting fed up with filling out profiles at every social network you join and re-adding all your friends. Yeah, those things are annoying but more importantly, the fact that you have to do it every time just to get basic value from each system means that each has been designed to benefit itself, rather than the individuals coming and going. The whole damn thing needs to be inverted, and like recently rejoined ant segments dumped from many an ant farm, the fractured, divided, shattered into a billion fragments-people of the web must rejoin themselves and become whole in the eyes of the services that, what else?, serve them! Imagine this: imagine designing a web service where you don’t store the permanent records of facets of people, but instead you simply build services that serve people. In fact, it’s no longer even in your best interest to store data about people long term because, in fact, the data ages so rapidly that it’s next to useless to try to keep up with it. Instead, it’s about looking across the data that someone makes transactionally available to you (for a split second) and offering up the best service given what you’ve observed when similar fingerprint-profiles have come to your system in the past. It’s not so much about owning or storing Address Book 2.0 as much as being ready when all the people that populate the decentralized Address Book 2.0 concept come knocking at your door. Are you going to be ready to serve them immediately or asking them to fill out yet another profile form? Maybe I’m not being entirely clear here. Admittedly, these are rough thoughts in my head right now and I’m not really self-editing. Forgive me. But I think that it’s important to say something before the big official announcement comes down, so that we can pre-contextualize this and realize the shift that’s happening even as the hammer drops. Look, if Google and a bunch of chummy chums are going to make available a whole slew of “social graph” material, we had better start realizing what this means. And we had better start realizing the value that our data and our social capital have in this new eco-system. Forget page views. Forget sticky eyeballs. With OpenID, with OAuth, with microformats, with, yes, with FOAF and other formats — hell with plain ‘ol scrapable HTML! — Google and co. will be amassing a social graph the likes of which has yet to be seen or twiddled upon (that’s a technical term). It means that we’re [finally] moving towards a citizen-centric web and it means great things for the web. It means that things are going to get interesting, for Facebook, for MySpace, for Microsoft, for Yahoo! (who recently closed 360, btw!) And y’know, I don’t know what Spiderman would think of OpenSocial or of what else’s coming down the pipe, but I’m sure in any case, he’d caution that, with great power comes great responsibility. I’m certainly excited about this, but it’s not all about Google. Moreover, OpenSocial is simply an acknowledgment that things have to (and have) change(d). What comes next is anyone’s guess, but as far as I’m concerned, Tim’s been more or less in the ballpark so far, it just won’t necessarily be about owning the Address Book 2.0, but what it means when it’s taken for granted as a basic building block in the vast clockwork of the open social web. This can all be made… awesome. If you only read me on RSS, you may never have seen the smirk of a catch phrase I use on this blog. If you haven’t, it’s been “This can all be made better. Ready? Begin.” for some time. I don’t know how I came up with it, but since blogs have this weird tradition of having a catch phrase, I grabbed that one and it stuck. Anyway, I dunno, “better” sounds kind of assumptively pejorative, as though achieving satisfaction is off limits. That you always have to be improving things; never enjoying. Whatever, it’s not a big deal. So, taking a line from Threadless, my catch phrase will now be: This can all be made awesome. Ready? Begin. Author Chris MessinaPosted on Oct 30th Categories Personal, Raw MaterialsTags awesome10 Comments on This can all be made… awesome. I thought I’d start a new category on my blog (not that they’re exposed in my current theme, but whatever) called “Raw Materials”. I oftentimes have thought fragments or observations that seem to be part of bigger trends or ideas that I don’t tend to blog about because they’re not substantial or clear enough to warrant a full post. But then later on, I realize that it would have been helpful to be able to cite earlier pieces of my thinking that lead to the current revelation. Rather than simply collecting Asides (as Matt does), I want to record, primarily for my own sake, where my head’s at and what’s filtering in to it. I mean, I could use Twitter for this, but sometimes, well, I have a little more to say than fits in 140 characters. Wikipedia states that Legal tender … is payment that, by law, cannot be refused in settlement of a debt denominated in the same currency. Currency, in turn, is a unit of exchange, facilitating the transfer of goods and/or services . I was asked a question earlier today about the relative value of open services against open data served in open, non-proprietary data formats. It got me thinking whether — in the pursuit of utter openness in web services and portability in stored data — that’s the right question. Are we providing the right incentives for people and companies to go open? Is it self-fulfilling or manifest destiny to arrive at a state of universal identity and service portability leading to unfettered consumer choice? Is this how we achieve VRM nirvana, or is there something missing in our assumptions and current analysis? Mary Jo Foley touched on this topic today in a post called Are all ‘open’ Web platforms created equal? She asks the question whether Microsoft’s PC-driven worldview can be modernized to compete in the network-centric world of Web 2.0 where no single player dominates but rather is made up of Best of Breed APIs/services from across the Web . The question she alludes to is a poignant one: even if you go open (and Microsoft has, by any estimation), will anyone care? Even if you dress up your data and jump through hoops to please developers, will they actually take advantage of what you have to offer? Or is there something else to the equation that we’re missing? Some underlying truism that is simply refracting falsely in light of the newfound sexiness of “going open”? We often tell our clients that one of the first things you can do to “open up” is build out an API, support microformats, adopt OpenID and OAuth. But that’s just the start. That’s just good data hygiene. That’s brushing your teeth once a day. That’s making sure your teeth don’t fall out of your head. There’s a broader method to this madness, but unfortunately, it’s a rare opportunity when we actually get beyond just brushing our teeth to really getting to sink them in, going beyond remedial steps like adding microformats to web pages to crafting just-in-time, distributed open-data-driven web applications that actually do stuff and make things better. But as I said, it’s a rare occasion for us because we’ve all been asking the wrong questions, providing the wrong incentives and designing solutions from the perspective of the silos instead of from the perspective of the people. Let me make a point here: if your data were legal tender, you could take it anywhere with you and it couldn’t be refused if you offered to pay with it. Let me break that down a bit. The way things are today, we give away our data freely and frequently, in exchange for the use of certain services. Now, in some cases, like Pandora or Last.fm, the use of the service itself is compelling and worthwhile, providing an equal or greater exchange rate for our behavior or taste data. In many other cases, we sign up for a service and provide basic demographic data without any sense of what we’re going to get in return, often leaving scraps of ourselves to fester all across the internet. Why do we value this data so little? Why do we give it away so freely? I learned of an interesting concept today while researching legal tender called “Gresham’s Law” and commonly stated as: When there is a legal tender currency, bad money drives good money out of circulation. Don’t worry, it took me a while to get it too. Nicolas Nelson offered the following clarification: if high quality and low quality are forced to be treated equally, then folks will keep good quality things to themselves and use low quality things to exchange for more good stuff. Think about this in terms of data: if people are forced (or tricked) into thinking that the data that they enter into web applications is not being valued (or protected) by the sites that collect the data, well, eventually they’ll either stop entering the data (heard of social network fatigue?) or they’ll start filling them with bogus information, leading to “bad data” driving out the “good data” from the system, ultimately leading to a kind of data inflation, where suddenly the problem is no longer getting people to just sign up for your service, but to also provide good data of some value. And this is where data portability — or data as legal tender — starts to become interesting and allows us to start seeing around through the distortion of the refraction. Think: Data as currency. Data to unlock services. Data owned, controlled, exchanged and traded by the creator of said data, instead of by the networks he has joined. For the current glut of web applications to maintain and be sustained, we must move to a system where people are in charge of their data, where they garden and maintain it, and where they are free to deposit and withdraw it from web services like people do money from banks. If you want to think about what comes next — what the proverbial “Web 3.0” is all about — it’s not just about a bunch of web applications hooked up with protocols like OAuth that speak in microformats and other open data tongue back and forth to each other. That’s the obvious part. The change comes when a person is in control of her data, and when the services that she uses firmly believe that she not only has a right to do as she pleases with her data, but that it is in their best interest to spit her data out in whatever myriad format she demands and to whichever myriad services she wishes. The “data web” is still a number of years off, but it is rapidly approaching. It does require that the silos popular today open up and transition from repositories to transactional enterprises. Once data becomes a kind of common tender, you no longer need to lock it; in fact, the value comes from its reuse and circulation in commerce. To some degree, Mint and Wesabe are doing this retroactively for your banking records, allowing you to add “data value” to the your monetary transactions. Next up Google and Microsoft will do this for your health records. For a more generic example, Swivel is doing this today for the OECD but has a private edition coming soon. Slife/Slifeshare, i use this and RescueTime do this for your use of desktop apps. This isn’t just attention data that I’m talking about (though the recent announcements in support of APML are certainly positive). This goes beyond monitoring what you’re doing and how you’re spending your time. I’m talking about access to all the data that it would take to reconstitute your entire digital existence. And then I’m talking about the ability to slice, dice, and splice it however you like, in pursuit of whatever ends you choose. Or choose not to. I’ll point to a few references that influenced my thinking: Social Capital To Show Its Worth at This Week’s Web 2.0 Summit, What is Web 2.0?, Tangled Up in the Future – Lessig and Lietaer, , Intentional Economics Day 1, Day 2, Day 3.